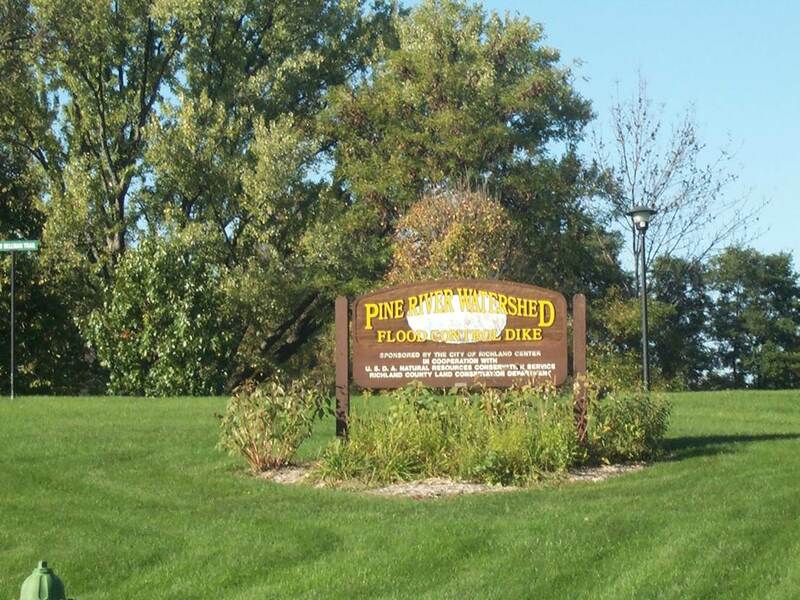 The Pine River Watershed Project is the beginning of the Recreation Trail which travels between Richland Center and Lone Rock. The Pine River Trail is temporarily under construction and is closed at County O all the way to Gotham until December. At that time, the snowmobile trails will open for the season, weather permitting. Alternate routes would take you on County O, then on to scenic County TB to Gotham where you can pick up the trail from there. 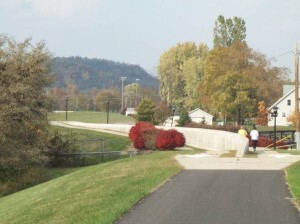 This easy-graded rail trail invites hikers and cyclers in spring, summer and fall, and snowmobilers in winter. 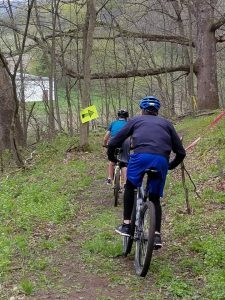 This 14.3-mile trail is laid on an abandoned rail bed, and gives riders a chance to enjoy the beauty of 250-foot river bluffs without having to ride over them. It gives access to the restored Railroad Depot at the corner of Seminary Street and Orange Street (US Hwy 14). It also allows passage through an arboretum and the restored savannah prairies at the site of the old mill dam. The dam, removed to allow a free flowing river, now is the site of riffels where anglers fish and canoeists can continue their down river journey. The arboretum is part of the bike trail enhancement. The site has nearly 200 varieties of trees and shrubbery nestled along the Pine River just south of the Seminary Street Bridge. Above the Seminary Street Bridge, the remnant bed of the Mill Pond has dried and is planted in tall prairie grass. Comprising of nearly 60 acres, the area is intersected by a historic suspended footbridge accessible from the dike bike trail. For a challenge you can take on several bluff-top climbs on a 15-mile on-road option which, while mostly on paved roads, features 1.7 miles of primitive gravel on Cardinal Crest Road through a tunnel of trees. Probably the most refreshing stretch is on WI 60 as the road hugs the edge of Bogus Bluff next to the Wisconsin River. 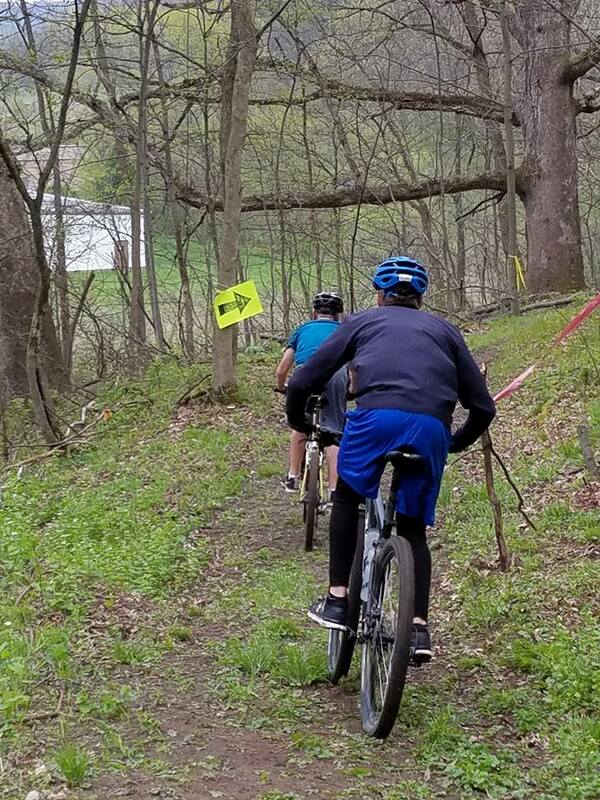 This new crushed-limestone rail-trail with several nice town parks makes for a pleasant family ride; or, you can get a workout by taking on the bluffs via the paved and gravel road route. 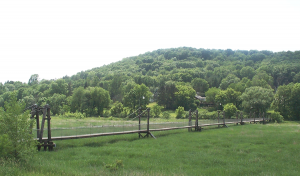 Scenery includes farm, river, and marsh views on the rail-trail; farm, woods, ridge-top, and Wisconsin River views on the road route. 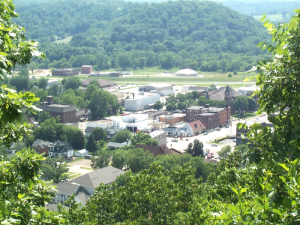 Parking and access is available at the Village of Lone Rock, the unincorporated community of Gotham, Twin Bluffs and in the city of Richland Center. The trail is free and open to the public. The trail does not allow unauthorized motorized vehicles. Here’s a tour to take on once you’ve gotten your climbing legs in shape. You’ll have to tackle four steep, 400- foot climbs to cover the whole route. It’s all part of the plan. The Ocooch Mountain Challenge was designed with a definite challenge in mind. Hilly or Flat…The Choice is Yours! Up for some breathtaking views? There are plenty of steep climbs and fast falling descents for those looking for them in the 15, 31, and 46 mile rides. Visit hilltop orchards and enjoy fresh crisp apples and cider. Looking for a more leisurely ride? The 8 mile tour takes riders on a nature bonanza, crossing creeks, traveling through meadows and under the shade of a tree-lined railroad bed. Enjoy amazing views all around you and festive stops along the way! Contact us for route information. A walking trail that was developed along the edges of the Pine River beginning at County AA and ending at Industrial Road, and from Krouskop Park to Wedgewood North Park. The trail features spectacular views of the Pine River, 5 canoe ports and 5 fishing piers. Plans are in the works to enhance the river by adding rip-rap to increase trout habitat. During the Winter season, tracks are laid down for cross country skiers, and the trails are wonderful for snow shoeing. New recreational trails are being created for year-round use on the City land located near the Armory, at 1350 Peebles Drive. Mountain biking and hiking take center stage during the warmer months, then in the colder months, cross country skiing and snow shoeing. Trails are still being worked on to get ready for when the snow flies. Southwest Partners’ members have worked tirelessly to create these recreational opportunities for our community! Trail work and maintenance on over two miles of trail that hug the hills is ongoing, but there is plenty of signage to help guide you. At this time, one trail is in progress and the rest are proposed trails. Parking is available in the Armory lot near the trailhead. What a beautiful place to get away from it all, right out your doorstep. Whether it is a quiet hike or a quicker ride, check out these trails. Miner Hill Trails Park has walking & hiking trails that encompass 50 acres of scenic wonder revealed along a trail that wanders past five overlooks, through woods and open meadows, and past an old quarry site, to the top of a bluff with a panoramic view of the city and countryside spreading out in the valley below. All trail overlooks are railed. The trails are complete with signs & areas for picnicking. There are six trails to choose from, ranging from 1/5 mile to 4/5 mile distances. Strickland Trail (1/5 mile) begins at the base of Strickland Park, with parking & playground equipment. You can also park & connect with Tower Drive Trail if you follow Court Street East. Here and there along the way, hikers will find resting and picnic spots for a leisurely pause on the trail. Miner Hill Trails Park does not take reservations. 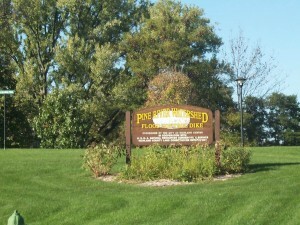 Wedgewood Park was developed in the summer of 2004 and encompasses 30 acres. It is divided into two parks, Wedgewood North & Wedgewood South. 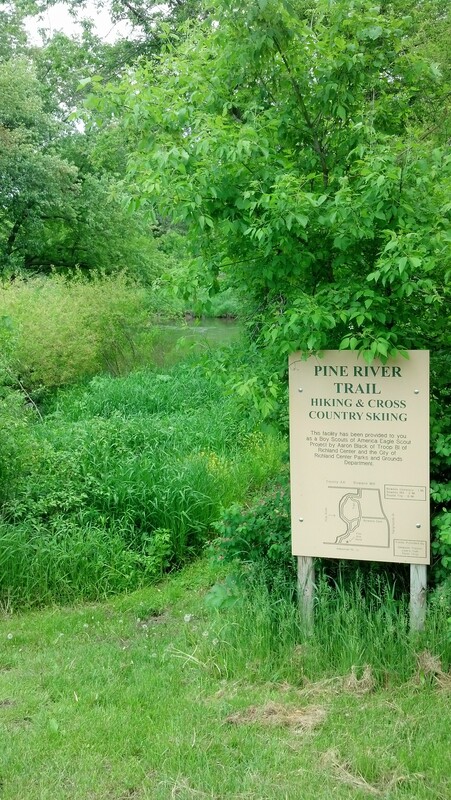 This land is adjacent to the Pine River and has about 2 miles of hiking trails, fishing areas, picnic shelter and tables, benches, signage maps and a parking lot. A large sitting area with a perennial bed, adjacent to a senior housing complex had been completed. Ash Creek Community Forest is Richland County’s largest park at 354-acres. It is located two miles south of Richland Center on State Highway 80. 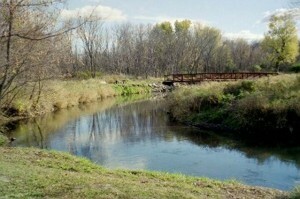 Ash Creek, a Class One brook trout stream, runs through the middle of this recreational property. Fishing regulations are governed by the Department of Natural Resources. The Community Forest allows public hunting in season. There are four miles of primitive hiking, biking, and horseback riding trails. No unauthorized, motorized vehicles are allowed in the forest. The site does not allow camping or fires of any sort. There are two parking lots with a capacity of fifteen vehicles each. Disc Golf is a rapidly growing sport for all ages and it’s available for you here in Richland Center. Players utilize flying discs (frisbees) to shoot into a chain basket (hole). Regular golf rules apply. The front 9 is located at Krouskop Park from N. Jefferson Road, and the back 9 continues under Hwy 14 to the footbridge. Disc Golf at Krouskop Park offers a wonderful opportunity to enjoy the great outdoors, get good exercise at your own pace and enjoy a new sport. The course runs along the picturesque Pine River and through the wildlife scrape along the dike trail. During the Winter season, tracks are laid down for cross country skiers, and the trails are wonderful for snow shoeing. Trails that have been laid down are double and triple wide to allow for skate skiing opportunities! There are double wide tracks laid along the Pine River from the City Utility Shop to Industrial Park Rd, along the grassy dike in Allison Park, under Hwy 80 into North Park. Cross the walking bridge and cut along the Pine River all the way under Highway 14 to Seminary Street! Once you have covered that, head up behind the legion to the UW Wellness Trails. A triple wide loop has been laid on the UW-Richland Soccer Field as well as at North Park around the ball diamonds. You can also enjoy the new Ocooch Mountain Recreational Trails on Peebles Drive! See maps above.